Have you heard of Jeon? If you hang out at as many Korean bars as I used to or lost yourself in K-Dramas you’ll usually see them. 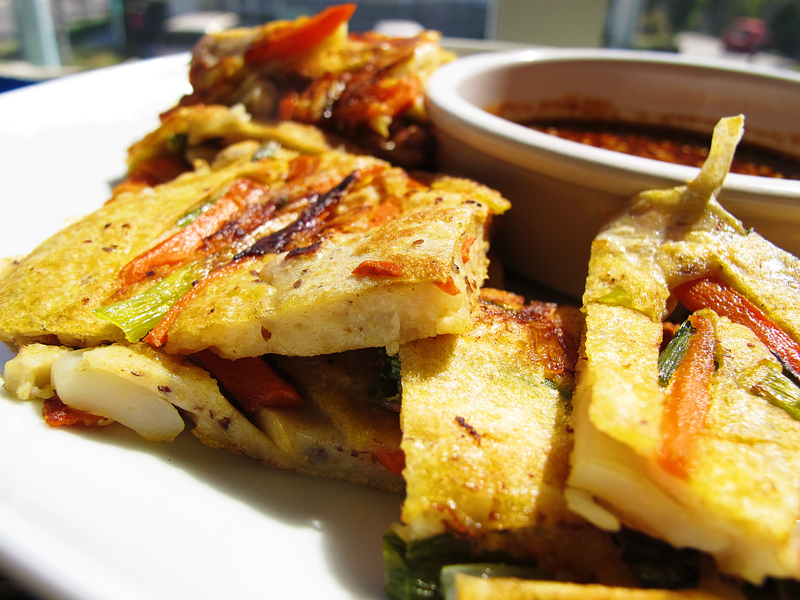 They’re wonderfully simple yet delicious savory pancakes brimming with veggies and/or meats. Typically eaten during cold winter months with rice wine, it’s ultimately ‘beer food’. I love how the pancakes are crispy on the outside but inside is soft, moist and fluffy. 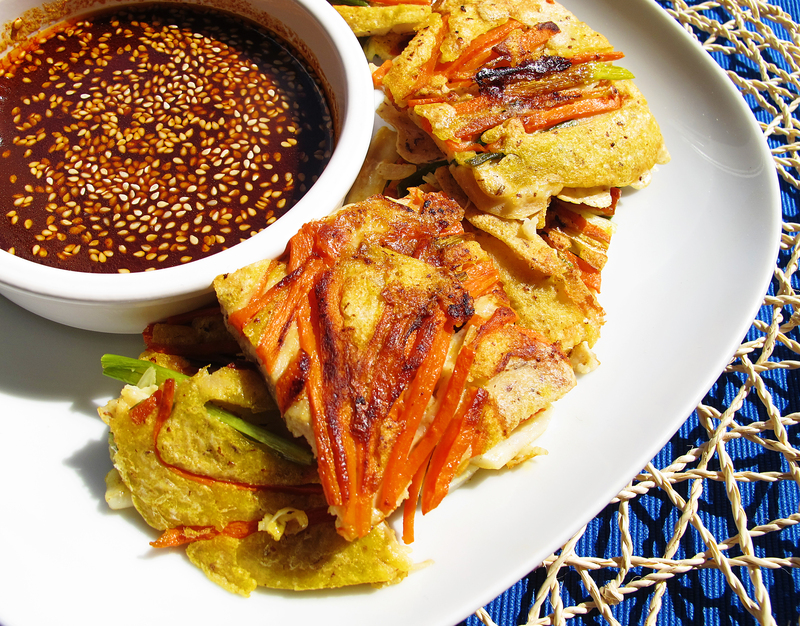 Pajeon, or scallion pancakes are the most typical but it’s even better with seafood such as shrimp or calamari. The batter is a simple mixture of water and flour but I like to make mine with wheat flour and this most recent time, I added flax seed meal for a fantastic nutty flavor. The consistency of the batter should be thin like a crepe batter, keeping the pancakes thin assures the crisp/fluffy ratio is perfect. My dipping sauce is a spicy soy but if you don’t like spice, just leave out the gochujang (Korean hot pepper paste), it won’t hurt my feelings any! Speaking of gochujang, it’s definitely one of my favorite ingredients these days. Gochujang is a savory, sweet, and spicy fermented chili pepper paste that is used in a lot of Korean cooking, Gochujang comes in a variety of spice level from mild to incredibly hot as well as different sodium levels, some brands are much saltier than others, you just have to taste test different brands to find the ones you love. I find myself adding it to stir-fries or even just on top of my rice at times. Add dry batter ingredients together and whisk to combine before adding water. Add about a cup of water to start then check the consistency. It should be runny like crepe batter, add more as needed. Should take about 1 ¼ cups. If too much water is added, add a few teaspoons of whole wheat flour until consistency is perfect. Wipe out skillet and repeat process.